As of 21/April/2018. Highway 39 is open! The camp grounds are open! Overnight: $12 for each camp site without an Adventure Pass or $10 a night with an Adventure Pass. Please check with the Forest Service or at the Cafe to make sure that the fee value reported here is correct, and also check the sign nest to the Visitor Center. The lake water level is extremely low and there is no swimming allowed in the lake due to health issues -- health issues with people and with the forest itself -- however the lake does get stocked with fish from time to time. Welcome to the Crystal Lake Camp Grounds web site. 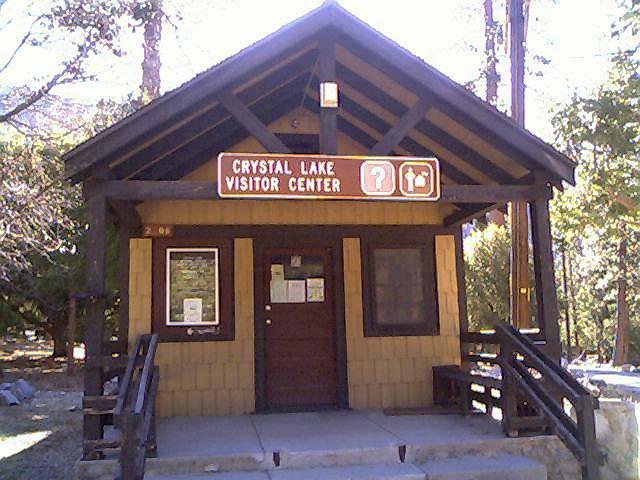 Here you will find accurate and timely information about the status of the Crystal Lake Camp Ground Recreation Area, located in the San Gabriel Mountains within the Angeles National Forest, maintained and operated by the United States Forest Service. The Crystal Lake Campgrounds are part of the Region 6 United States Forest Service and are not privately owned, American citizens own the forest and the campgrounds within the forest. Information about the region can be provided by the Forest Service by calling (626) 335-1251. Also provided on this web site is information about the road conditions heading up to the recreation area, along with detailed information on what the Crystal Lake Trading Post offers to campers, hikers, bikers, fishers, and bicycle riders who visit. The links provided on the left hand side of your browser can be used to navigate the web site. Also we would greatly appreciate receiving comments and suggestions from you, either about the camp grounds themselves or this web site. This web site is privatly owned and operated and is not connected with either the Forest Service or any of the volunteer organization which work within the Angeles National Forest. Check out the "Latest News " link for information about any highway closures and progress that is being made within the Crystal Lake Campgrounds. Also check out the link called "Coming Events" for scheduled volunteer projects that you can participate in! Crystal Lake and the surrounding regions were damaged badly in the 2002 Curve Fire however restoration of the campgrounds is almost fully complete! The whole campgrounds really look wonderful, clean and pristine. The hiking and nature trails around the Crystal Lake Basin have been maintained to some extent and some trails have been completly restored. However some trails still need to have the volunteers to help restore them. Trail working volunteers may join the San Gabriel Mountains Trailbuilders in the continued restoration process for trails in and around Crystal Lake and if you would like to volunteer your time, please email me here and I will let you know when, where, and what you need to know to join us. You can subscribe to receive automatic updates about Crystal Lake, the highway, and general status reports on what's going on by clicking on the "Automatic Updates" link to the left of the screen. You may rent a cabin my calling 626-910-1029 to talk with the Crystal Lake Cafe and ask about Cabin Rental (click here)". There are a small number of cabins of different sizes, some with running water, one without.